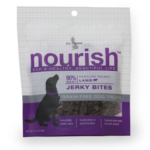 Sourced in New Zealand and made with humanely-raised meats, nourish™ Jerky Bites are gently air-dried at low temperatures, in small batches, to naturally preserve the meat without using artificial preservatives. High in protein, they are made with just a handful of all-natural ingredients. The perfect treat with an irresistible taste and texture – to satisfy even the pickiest of pups.